P14M drugs in 9 months Are we losing the drug war? TAGBILARAN CITY, Bohol, October 6 (PIA)—When some authorities did not lack in advice against those who continue with the illegal and destructive drug trade, Bohol police authorities still were able to account over P14 million in illegal drugs, taken off from the streets from January to September 2018. Over this, questions as to how effective is the campaign on drugs start to resound. Recent obtained data showed that the deaths of personalities who fought it out with the police, the noise behind the alleged extra judicial killings and the non-committance of several officials on the campaign seem to tilt the balance to failure. With this, many have betted that the police could lose the steam anytime when the participation they expect from communities would come out less than desired. “True, the campaign once struck fear, there was abrupt decline in illegal drugs trade, but the over-all effect after self-confessed human rights advocates side with drug personalities than innocent victims is now sowing discontent,” a member of the Bohol Provincial Peace and Order Council said. “The courts have also been accused as doing less than expected in processing cases,”kin of drug victims have said. “Over this, criminals see the opportunity,” confesses a police officer who politely refused to be named for lack of authorization. Camp Dagohoy reports recently showed that in the nine months of police operations, it was in the month of July that they lifted off the streets nearly half a kilo of illegal drugs or methampithamine hydrochloride, its biggest haul of drugs as yet at 485.34 grams. The haul was worth P5,724, 888.00, based on the Dangerous Dugs Board value which was then pegged at nearly P12,000.00 per gram. It may be recalled that late last year, just as police intensified its Oplan Double Barrel Reloaded, there was a noted decrease in drug trade as shown by police operations. “Emboldened by the magnitude of people who are still dependent upon the illegal industry, drug personalities went back to the old trade despite the risks,” another police intelligence operative admitted. “The problem is again complicated by many local leaders who have shown an apparent wait and see attitude,” a lady officer also put it in. “Many have also seen who those who surrendered and were placed under rehabilitation backslid without any consequences, and the move to go back to the old trade was just too tempting,” admitted another police source. “Little did they know that we have placed these persons of interest under surveillance,” he added. “The problem is compounded and further complicated by self-confessed human rights groups who would rather defend drug personalities than the innocent victimsfalling victims to the illegal drugs trade,” the intelligence officer continued. The effect was too blatant that in January, from only 11 grams of drugs worth P 129,800 confiscated during 4 police operations and 4 persons arrested, the figure burst into P1.391, 456 in February where there were a total of 19 police operations that nabbed 27 drug personalities. From then on, figure went up and down never went lesser that than 178,000. For a total of 195 police operations, from January to September 26, police authorities also accosted 239 persons in violation against illegal drugs ranging from mere possession, possession of illegal paraphernalia or in the becoming more famous buy-bust operations. And when everybody thought the nearly half a kilo of illegal drugs accounted and denied off the streets is the last of it all, in August, authorities again secured 205 grams with a street value of P2,419,000. That month, in 65 police operations, 71 personalities at least stayed overnight in slammers or about 110 cases were filed against these suspects. By September, in just 26 days, and in 20 police and coordinated operations with the Philippine Drug Enforcement Agency, authorities took into custody 161.27 grams of illegal drugs at an estimated street value worth P1,902,986 and nabbed 33 persons now facing a total of 45 cases in court. Department of Trade and Industry (DTI) through its attached agency, Center for International Trade Expositions and Missions (CITEM) in coordination with the Philippine Trade and Investment Center in Paris (PTIC-Paris), recently participated at the Maison et Objet, the premier and largest French trade fair for interior design held on 8-12 September 2017 in Paris, France. 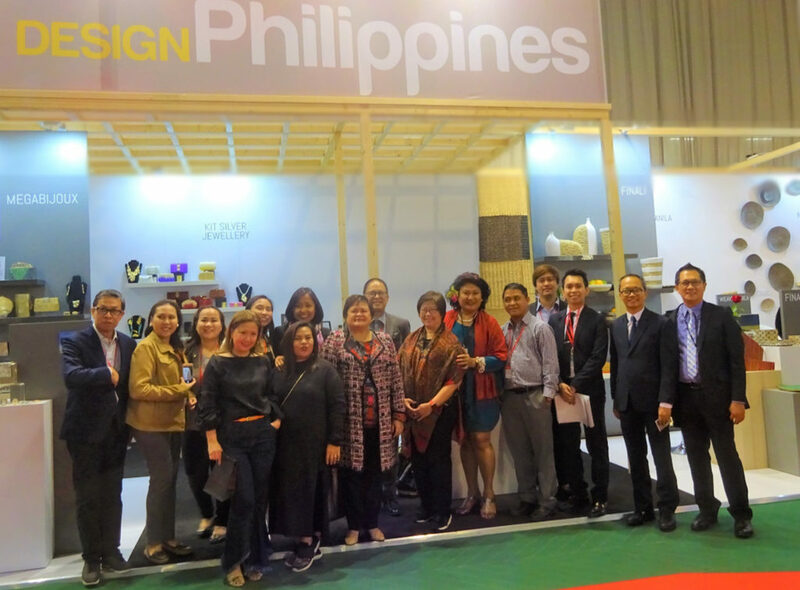 “The presence of DESIGN PHILIPPINES at this year’s Maison et Objet is a testament of DTI’s commitment to continuously support and provide global platforms for Filipino exporters and designers,” said DTI Undersecretary for Trade and Investments Promotion Group Nora K. Terrado. As the country’s third participation in one of the world’s biggest lifestyle event which attracts over 75,000 visitors worldwide including interior designers, decorators, architects, hotel directors, art directors, stylists and trendsetters, showcased DesignPhilippines which highlighted and represented the country’s creative sensibilities. Among the world-class Filipino companies showcased at the DesignPhilippines are: Agsam Fashion Fern, Beatriz, Catalina Embroideries, Finali, Kit Silver Jewellery, Megabijoux, Nature’s Legacy, and Weave Manila. “We strive to open doors for our emerging designers and exporters to access global partners who frequent the world’s most important international trade shows such as the Maison et Objet which is held twice a year in Paris. This is key in enabling them to meet new trade buyers and be exposed to overseas markets,” Terrado added. Led by DTI’s CITEM, DesignPHILIPPINES is a branding initiative that positions the Philippines as a sourcing destination for finely crafted products for the world market. “We see the vital role that the government plays when it comes to accessing markets for our local exporters. As we participate in various international trade exhibits, we also seek the support of the private sector and businesses to collaborate with us in joining international trade fairs where they could potentially meet new buyers as well as promote Philippine design to the rest of the world,” emphasized Terrado. TAGBILARAN CITY, July 28, (PIA)–The five day Sandugo regional products showcase better known now as Sandugo Trade Expo closed off Sunday capping a total sales of P12,278,357.00 in five days of selling by some 94 small and medium enterprises from at least six regions. First started as Bohol Products Trade Fair, the event which has drawn national and international buyers has now gathered the best showcase of the regions which include processed foods, homestyle gifts and toys, furniture, fashion accessories and other crafted products, according to Department of Trade and Industry trade and industry development specialist Blair Panong. The trade expo coincides with the annual celebration of Boholano brand of friendship celebrated in the July Sandugo Festival which commemorates the historic blood compact between Spanish conquistador Miguel Lopez de Legazpi and Boholano chieftain Sikatuna. Romping out as topsellers during the trade expo exhibited at the Island City Mall between July 19 to 23, were Cebu’s Maexel Chi-cha bites and Snack Food with P271,530 in cash sales for processed foods, Cebu’s GTH Foundation Inc., OTOP Store and Tindahang Pinoy with P797,000 in cash and under negotiations sales. For furniture, Region 8’s Naty’s Antique Furniture closed some P829,000.00 in cash and under negotiations sales upon the exhibit’s egress Sunday. With the Trade expo adopting green economic development themes since three years ago, organizers also handed a special Green Product Award to TAGBTIC. 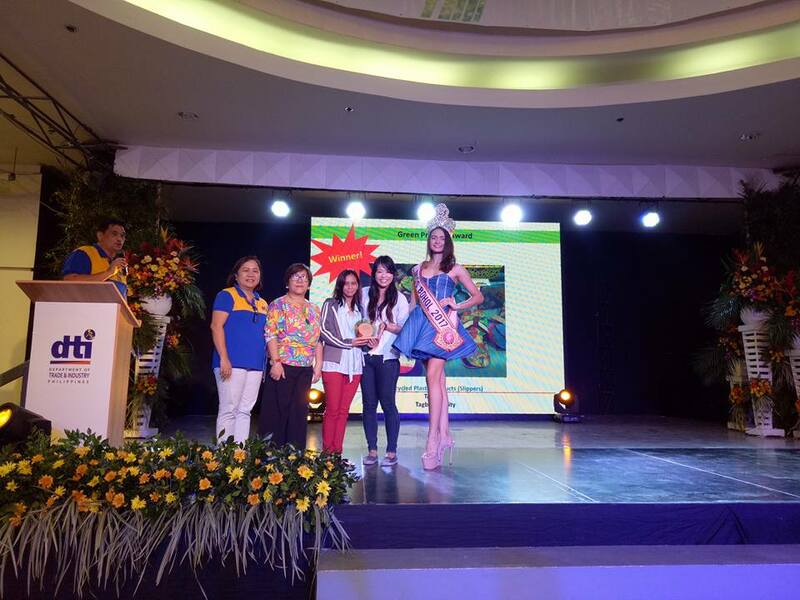 No less than DTI Regional Director Asteria Caberte, Bohol OIC-PD Marisol Balistoy and the newly crowned Miss Bohol 2017, Ms. Pauline Amelinckx handed the awards and citations during the highlights of the expo closing ceremonies. The DTI, which has been largely involved in the new products diversification and development as well as training workers on production efficiency and greening the value chains said in the expo in Bohol, pushes forward the new products crafted after the DTI handed Shared Service Facilities and cascaded product design development trainings. Largest groups at the expo are Bohol with 34 exhibitors: Cebu with 32, Negros with 10 and Siquijor with 4 for a total of 80. Five other exhibitors come from Region 8, including furniture top seller Naty’s Antiques, another 5 more from region 13 (Agusan and Surigao) which brought in processed food. From Region 11 is Davao del Norte brining in processed food and non-food items. 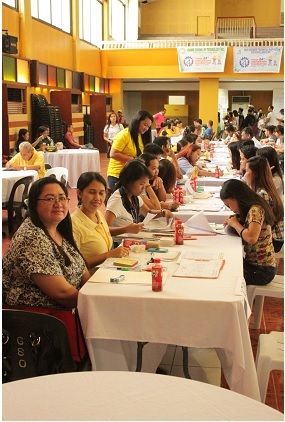 Each from region 18 (Negros Island region) and Region 6 had one exhibitor. Presenting the Trade Expo Products which banner the theme “Partnering and Engaging for Change”, the DTI put up a creatively conceptualized “Exquisitely Visayas” fashion show. PHYSICAL Works for the Bonotbonot Small Reservoir Irrigation Project (SRIP) in Buenavista town will go full blast now. This after Cabinet Secretary Leoncio Evasco Jr., Administrator Ricardo Visaya and Region 7 Director Modesto Membreve of the National Irrigation Administration (NIA), Rep. Erico Aristotle Aumentado of Bohol’s 2nd District and Buenavista Mayor Ronald Lowell Tirol led groundbreaking rites at the proposed site on June 26. As early as November 2015, Aumentado had revealed that the P70-million project to be proposed in NIA’s 2016 fund for insertion into the General Appropriations Act GAA). The solon’s father, former governor and immediate congressional predecessor Erico Boyles Aumentado and Membreve had proposed the project, along with the Benliw (Ubay) SRIP at P100 million, the Mabini-Cayacay SRIP at P85 million and the Malinao (Pilar) Dam Improvement Project at P200 million. For Tagbilaran City-based NIA Region 7, only these four projects made it to the cut in the 2016 GAA under its locally funded Rapid, Inclusive, and Sustained Economic Growth projects. While most regional offices are based in Cebu, the elder Aumentado pushed for the creation of the NIA Region 7 office in Bohol – the region’s rice granary. Bohol used to belong to NIA Region 8 based in Tacloban City. The Evasco-Visaya-Membreve-Aumentado team also visited Danao town where the Hibale SRIP is also being planned to be constructed. Aumentado said Evasco and President Duterte are working hard to give more benefits to the farmers. Evasco was Duterte’s campaign manager during the latter’s presidential bid. Both are working towards the realization of their campaign promise of construction more irrigation projects and that farmers will be able to avail of irrigation services, this time, free of charge. The solon said he and Visaya, retired Chief of Staff of the Armed Forces of the Philippines under President Duterte, will meet in Manila most likely before the Chief Executive gives his State of the Nation Address (SONA), with would-be investors for the Hibale and the Northeast Bohol Catch Basin. As envisioned by the elder Aumentado, the huge project is expected to irrigate 19,000 more hectares of rice lands in the northern Bohol towns. On top of irrigation, it will also have power, potable water and eco-tourism components. It will be designed to generate at least 10 megawatts of power. It is also expected to make potable water available to far-flung barangays not yet served by the existing small waterworks projects of the beneficiary towns, the solon added. ONE “major major” potable water system to serve Bohol’s 2nd District? Rep. Erico Aristotle Aumentado said this is not far off as talks with two big time investors showed them to be bullish with the idea. Aumentado said the off hand, the investors said they are keen on putting in from P2.5 billion to P3 billion for a gigantic potable water system. He added that a big chunk of the investment would go to the pipelines that would understandably be kilometers long. He said the project is the final block in preparing his district for major investors and light industries to come in. Without water, the solon said, the 2nd District cannot fly or soar. “Water is a basic infrastructure that should be in place before one can invite investors to locate their businesses here,” he said. To note, he has coordinated with national and local government agencies and the private sector to improve the road network, expand major ports and provide power to islands and far-flung hinterland barangays in his district. He tapped the Department of Public Works and Highways (DPWH), Department of Education (DepEd), National Electrification Administration (NEA), National Irrigation Administration (NIA), Department of Science and Technology (DOST) and the Department of Labor and Employment (DOLE), among others, for available funds to improve infrastructure in his district. “Water is the last piece among these imperatives of development before we can even entertain numerous investors to invest in the 2nd District,” he explained.